The modern exercise industry has little in common with its "iron-game" lineage. The greatest aspect of modern exercise to change is the reduced use of compound movements. A proper weightlifting regimen should be based around pushing, pulling, pressing and squatting. These basics are infrequently used, and results have suffered. This change has occurred for a variety of reasons, but none of the rationale to avoid compound lifts is associated with improving the training effect or goal achievement. Instead, the loss of compound exercises is notably due to modern facilities prohibiting the use of these classic lifts, poor coaching practices, and a general "softer" public approach to bodybuilding/exercise. If there is one body region that's suffered the most due to this training shift, it is unquestionably the legs. Free-standing squat racks, platforms and chalk stands were once standard, but they are now rarities. In their place stand multitudes of machines that make it 'easy' to get fit but are inferior to the rugged domain of the "iron-game." 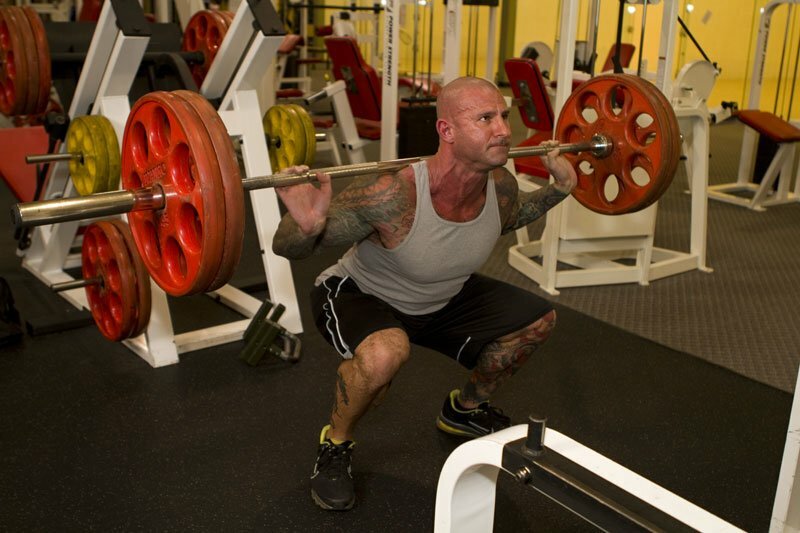 Make no mistake, to build powerful legs, training begins in the squat racks. Squats form the basis of all weightlifting programs. Without their inclusion, results lag and training time will be less efficient. The need to utilize squats runs deep. Most exercise enthusiasts must increase their overall leg development. This concept will seem peculiar, but as you utilize compound lifts with notably improved leg strength, the amount of weight used is greater and thus creates a super-compensatory effect of total body growth. Basically, greater leg strength will accelerate upper-body development. One of the greatest deterrents to performing squats is the claim they create injurious situations or aggravate existing concerns (such as knee or back pain). This is not because of the movement, but poor technique performing the lift (typically due to insufficient core strength), flexibility, and proper mechanics. Squats are required for anyone focused upon achieving their fitness, health, or sports performance goals, with few exceptions. "Welcome to the iron church. To your left is the altar of squats..."
Tempo. The concentric (raising of the load) action is under control with no "cheating." Cheating lessens the training effect. Eccentrically lower the weight with complete control, no rounding of the back, and maintain a "neutral" back position. After eccentrically lowering to parallel position, drive upward at an explosive pace, roughly 2-to-3 times faster. Never allow the upper body to "fall forward." The torso angle is approximately 45 degrees. Do not use such a heavy load that you perform the movement improperly. Unless you have an existing medical condition that has been diagnosed by a physician, I recommend lifting "raw." Don't wear belts or wraps. Warm-up sets or lower-intensity repetitions should not be counted. Once you are at parallel, drive your feet down. Imagine spreading the floor away from you as you rise upward. Major point to remember: Anyone who has watched my videos or trained alongside me will know how serious I am when it comes time to "bring it." There is no better place to bring it than in the squat racks. As you enter the rack, take your grip, stare at the bar and, as you close your eyes, visualize the successful completion of the set. Open your eyes as you "flip the switch" with adrenaline rushing. Widen base to near-rack width, feet parallel and perform "good morning" to 45-degree angle, then squat down before exploding upward.